In recent years, xylanases have attracted considerable research interest because of their potential in various industrial applications. The yeast Pichia pastoris can neither utilize nor degrade xylan, but it possesses many attributes that render it an attractive host for the expression and production of industrial enzymes. The Xyn2 gene, which encodes the main Trichoderma reesei Rut C-30 endo-β-1, 4-xylanase was cloned into the pPICZαA vector and expressed in Pichia pastoris. The selected P. pastoris strains produced as 4,350 nkat/ml β-xylanase under the control of the methanol inducible alcohol oxidase 1 (AOX1) promoter. The secreted recombinant Xyn2 was estimated by SDS-PAGE to be 21 kDa. The activity of the recombinant Xyn2 was highest at 60°C and it was active over a broad range of pH (3.0–8.0) with maximal activity at pH 6.0. The enzyme was quite stable at 50°C and retained more than 94% of its activity after 30 mins incubation at this temperature. Using Birchwood xylan, the determined apparent Km and kcat values were 2.1 mg/ml and 219.2 S-1, respectively. The enzyme was highly specific towards xylan and analysis of xylan hydrolysis products confirmed as expected that the enzyme functions as endo-xylanase with xylotriose as the main hydrolysis products. The produced xylanase was practically free of cellulolytic activity. The P. pastoris expression system allows a high level expression of xylanases. Xylanase was the main protein species in the culture supernatant, and the functional tests indicated that even the non-purified enzyme shows highly specific xylanase activity that is free of cellulolytic side acitivities. Therefore, P pastoris is a very useful expression system when the goal is highly specific and large scale production of glycosyl hydrolases. Xylans are major hemicellulose component of plant cell wall, usually accounting for 20%–30% of their total dry mass. As they are the second most abundant natural polysaccharide after cellulose, complete degradation of them could generate various forms of cellulosic biomass and allow utilization of such low-cost raw materials for industrial applications . Xylans have a relatively complex structure based on a non-branched β-1,4-glycosidically linked xylose backbone. Depending on the origin, the backbone structure is substituted to various degrees with acetyl, L-arabinofuranosyl, glucuronyl and 4-O-methylglucuronyl groups . Complete degradation of xylans requires the synergistic action of several enzymes of which EC3.2.1.8-endo-beta-1, 4-xylanases are the crucial enzymes for depolymerization . In recent years, xylanses have attracted considerable research interest because of their potential industrial application, such as in biobleaching, paper making and in the food and animal feed industries [4–6]. Various microorganisms, such as bacteria, yeasts, and filamentous fungi were found to naturally secreted xylanases. The Trichoderma species has long been shown to secrete large amounts of efficient xylan-degrading enzymes, which render it an attractive microorganism for industrial enzyme production. The two major endo-xylanases secreted by this fungus are Xyn1 and Xyn2. Xyn1 has an acidic pI (5.5), possesses a smaller, tighter groove than Xyn2, and a lower pH optimum . Xyn2 has a basic pI (9.0) and a wider pH range. Both Xyn1 and Xyn2 produce similar hydrolysis end products. However, Xyn2 represents more than 50% of the total xylanolytic activity of this fungus and tends to produce larger oligosaccharides . Today, the recombinant production hosts are preferred [8–10]. The recombinant production in fungal hosts, such as Trichoderma reesei, is not without problems, since they produce many enzymes at the same time. Although expression of some major enzymes (e.g. cellulase) has been knocked out, they still produce other enzymes that in certain applications can be problem . Thus, production systems, in which a minimal amount of interfering side activities are produced, is desired. Xylanases can be produced in secreted form from E. coli, however, the production level is very low. [9, 12–15]. The yeast Pichia pastoris can neither utilize nor degrade xylan, but it possesses many attributes that render it an attractive host for the expression and production of xylanases. As a eukaryote, Pichia pastoris has many of the advantages of higher eukaryotic expression systems such as protein processing, protein folding, and posttranslational modification, while being as easy to manipulate as E. coli or Saccharomyces cerevisiae. It is faster, easier, and less expensive to use than baculovirus or mammalian expression systems, and generally gives higher expression levels. As a yeast, it shares the advantages of molecular and genetic manipulations with S. cerevisiae and has the added advantage of 10 to 100 fold higher heterologous protein expression levels [16, 17]. These features make Pichia very useful as a protein expression system. In this study, we describe the molecular cloning of the T. reesei Xyn2 gene in P. pastoris. Expression of the Xyn2 gene in P. pastoris was obtained with the aid of multicopy plasmids, using the strong P. pastoris promoter-terminator expression cassettes derived from the inducible alcohol oxidase1 (AOX1) gene. In addition, the enzymatic properties of the recombinant xylanase were characterized. The mature Xyn2 gene was prepared from first-strand cDNA prepared from T. reesei Rut C-30 by using sequence-specific PCR primers. Thus a fragment of 570 bp of Xyn2 gene was obtained and sequenced [GenBank: EU532196]. The calculated molecular mass (21 kDa) is in good agreement with the molecular mass of native Xyn2 isolated from T. reesei . The T. reesei Rut C-30 Xyn2 gene has the same nucleotide sequence with VTT-D-79125 [GenBank: S67287]. Both of them are 99% identical to wild type QM6α [GenBank: U24191], differing only two base pair substitutions (nucleotide 43, 272). The two substitutions probably resulted from its mutagenesis steps used in the mutant selection program [18, 19]. The two specific primers (Up1 and Down1) were designated to incorporate the restriction enzyme sites EcoRI and NotI respectively at their 5' ends, allowing the directional cloning of the Xyn2 gene into pPICZαA expression vector. The target fragment was integrated into P. pastoris X-33 strain. The transformants were selected on YPDS plate containing zeocin and the integration of Xyn2 gene into AOX1 location in the genome was further confirmed by PCR. The most desired integrant was chosen for small-scale induction. The size of recombinant xylanase, determined by SDS-PAGE (Figure 1A) was 21 kDa, similar to that of the native xylanase secreted by T. reesei. SDS-PAGE also showed that the xylanase was the major protein (over 95% of total protein as detected by densitometer) secreted by P. pastoris into culture medium. Therefore, the procedure for protein purification was not necessary. SDS-PAGE and Zymogram analysis of expressed products. (A) SDS-PAGE analysis for expressed products. Lane 1: protein marker; Lane 2–7: the culture supernatant containing recombinant xylanase from positive clones on day 1, 2, 3, 4, 5, and 6; Lane 8–10: cell lysate from recombinant P. pastoris on day 1, 3, and 5. (B) Zymogram analysis for xylanase activity. For optimal production of Xyn2, the recombinant P. pastoris was cultured in 2 L bioreactor. 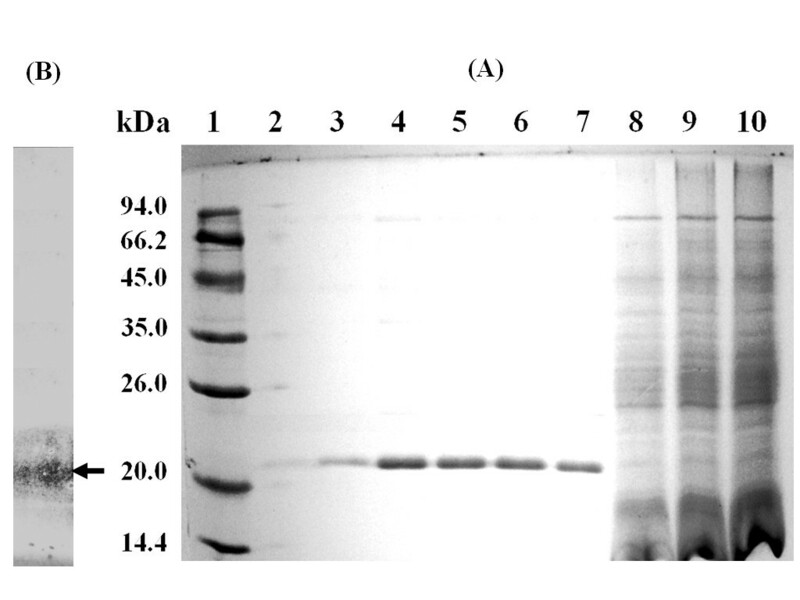 Both the highest xylanase activity (4,350 nkat/ml) and protein concentration (0.35 mg/ml) in culture supernatant was recorded after 72 h induction (Figure 2). However, the highest cell dry-weight (66 g/L) was obtained at 90 h. Both xylanase activity and cell dry-weight decreased slightly in the late induction period (after 96 h). Time course of xylanase activity produced by recombinant P. pastoris. When the culture medium (after induction) were subjected to native-PAGE, xylanolytic activity was detected using oat-spelt xylan as substrate; Immersion of the substrate gel in ethanol resulted in precipitation of undegraded xylan, which enhanced contrast and revealed only one clear band against a black background (Figure 1B). Enzymatic assay at different temperatures revealed that the recombinant Xyn2 has an optimal activity at 60°C (Figure 3A). Activity decreased rapidly with temperature, i.e., at 80°C, activity of the recombinant protein represented only 30% of the optimum. Concerning the effect of the pH, the enzyme showed an optimal activity at approximately pH 6.0 (Figure 3B). When the pH was below 3.0 and above 8.0, only 30%–40% of the maximum activity was reached. Although the highest activity was measured at 60°C, the enzyme is not stable at this temperature (only 40% activity retained after 30 min incubation). However, the recombinant Xyn2 was stable at 50°C, and the total activity retained more than 94% after 30 min incubating at this temperature (Fig 3C, D). Characterization of the recombinant Xyn2. (A) Effect of temperature on the activity of Xyn2. (B) Effect of pH on the activity of Xyn2. (C) The temperature stability of Xyn2 was determined after preincubating the enzyme in the absence of the substrate for 30 min at 50, 60, and 70°C. 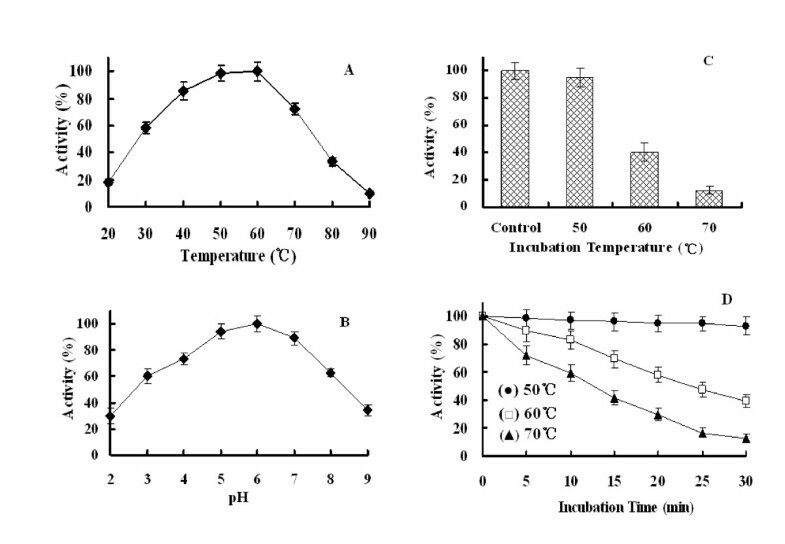 (D) The thermostability of Xyn2 at different temperatures was determined by preincubating the enzyme at these temperatures in the absence of substrate for 5, 10, 15, 20, 25, and 30 min before measuring its activity. The xylanase activity prior to the preincubations at different temperature was taken as 100%. The hydrolytic activity of the recombinant enzyme on various substrates was determined (Table 1). The highest activity (108%) was observed with the Birchwood xylan followed by the oat-spelt xylan (100%). The enzyme exhibited low activities towards cellulosic substrates, such as Gellan gum (11%), Avicel (1.9%) and CMC (1.4%). The Michaelis-Menten constants were determined for the substrates. The Km and kcat were 2.1 mg/ml and 205.7 s-1 for Birchwood xylan, and 1.8 mg/ml and 168.7 s-1 for oat-spelt xylan, respectively. 1The activity for oat-spelt xylan was defined as 100%. The polysaccharide-binding capacity of the recombinant Xyn2 was determined by incubating the enzyme with Avicel or oat-spelt xylan. As shown in Figure 4, the recombinant enzyme could not bind to Avicel, as about 95% enzyme activity still remained in supernatant. In contrast, the enzyme did show its capacity to bind to xylan and 75% of the enzyme activity remained in the supernatant. Effect of different concentrations of Avicel and oat-spelt xylan on the binding ability of the recombinant Xyn2. Xylanase (25 μg) was incubated with 1–24 mg/ml Avicel or oat-spelt xylan in 50 mM citrate phosphate (pH 5.0) at 4°C. The recombinant Xyn2 has been used to hydrolyze substrates at 5% concentration. 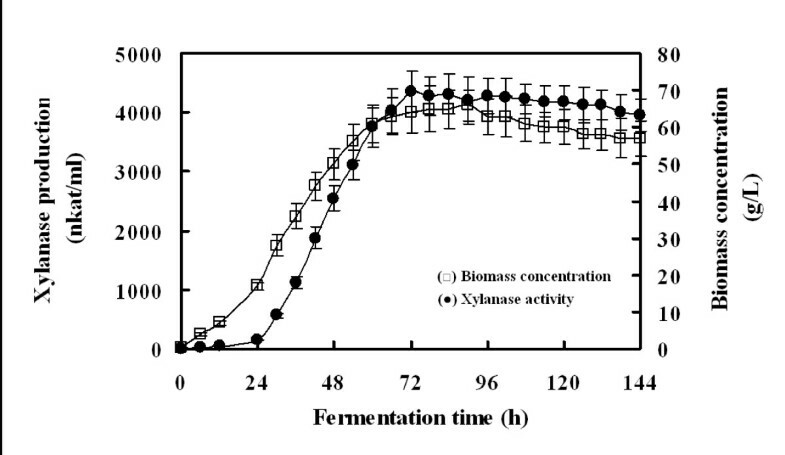 Yield of enzymatic hydrolysis was highest when Birchwood xylan was used as the substrate (Figure 5). The wheat bran hydrolysis was lowest (only 30%), but the hydrolysis for both xylan and wheat bran linearly increased with the increasing of reaction time. 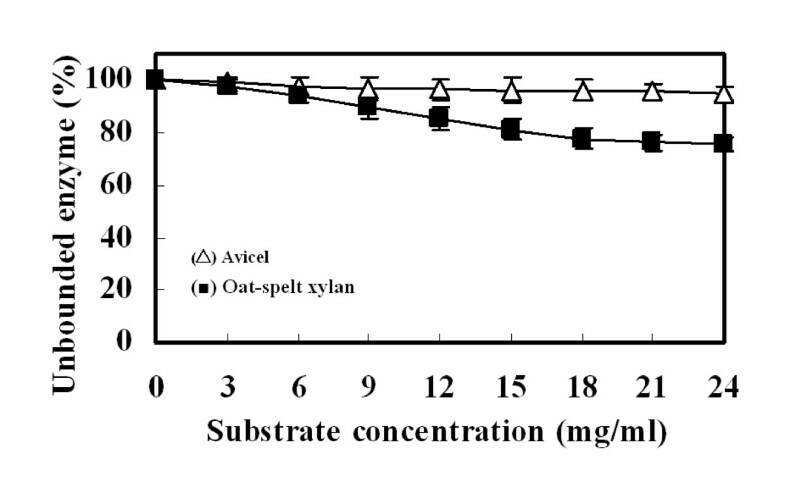 The products of hydrolysis of oat-spelt xylan were analyased by TLC. The predominant hydrolysis end product of oat-spelt xylan was xylotriose (Figure 6). The xylotriose was produced within 5 min of the reaction period. As the reaction time increased, both the xylotriose and xylobiose concentration increased. These results confirmed that the recombinant Xyn2 was an endo-xylanase. Hydrolysis capacity of the recombinant Xyn2. 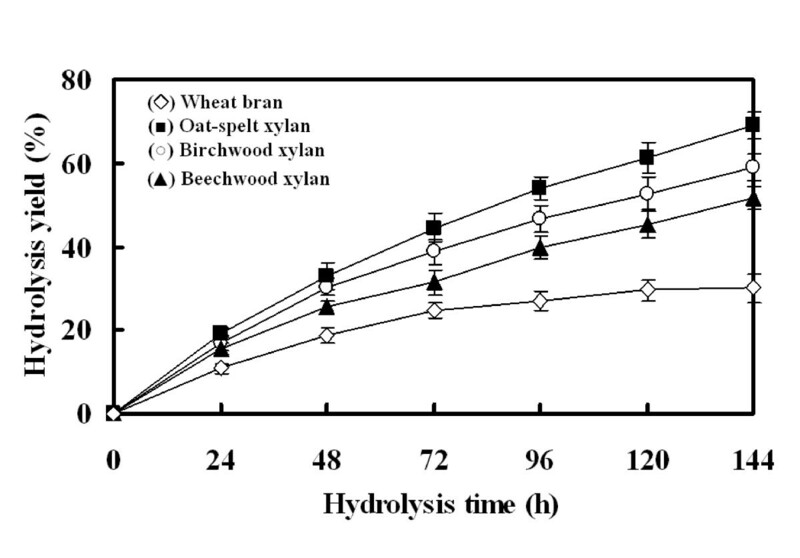 The hydrolysis yield of Oat-spelt xylan, Birchwood xylan, Beechwood xylan and Wheat bran using purified recombinant xylanase. Substrates (2.5 g) were incubated with 1000 nkat of the enzyme in 50 ml 50 mM citrate buffer (pH 5.0) and the reaction was carried out at 50°C with shaking at 150 rpm. Analysis of the hydrolyzed products by the recombinant Xyn2. Oalt spelt xylan (40 mg) was incubated with 1000 nkat of the enzyme in 2 ml 50 mM citrate phosphate (pH 5.0) and the reaction was performed at 50°C for 12 h and then the hydrolyzates were analyzed by TLC. The filamentous fungus Trichoderma reesei (also known as Hypocrea jecorina) is one of the most efficient xylanase and cellulase producers. The highest total beta-xylanase activity obtained in shake flasks for hyperproducing mutant T. reesei Rut C-30 was up to 5400 nkat/ml . However, the T. reesei culture supernantant contains many enzymes involved in both hemicellulose and cellulose degradation, and these side acitivities can be a problem for use in many applications. To resolve this problem, many researchers utilized heterologous expression system to produce xylanase from recombinant microorganisms [8–10]. In this study, the xyn2 gene from T. reesei Rut C-30 was successfully cloned and expressed in P. pastoris. For functional characterization, an unpurified enzyme was used and results indicated that even the non-purified enzyme shows highly specific xylanase activity. Therefore,T. reesei Xyn2 produced in P. pastoris has an advantage of showing xylanase activity that is practically free of harmful side activities. Currently, the heterologous expression has become one of the main tools for the production of industrial enzymes . And P. pastoris was one of the favorite expression hosts because of many advantages as we described previously[16, 17]. The Xyn2 gene was inserted between a yeast promoter and transcription terminator on multicopy episomal plasmids to achieve high levels of gene expression . For this purpose, we used the strong P. pastoris AOX1 promoter-terminator cassettes. In addition, the secretion signal sequence from S. cerevisiae α factor prepro peptide has been used to achieve a secretory expression. As a result, the recombinant xylanase was successfully secreted into the medium as a major protein with 95% purity and apparent molecular mass of 21 kDa. The highest total β-xylanase activity obtained in shake flasks for the most efficient recombinant P. pastoris strain was 4350 nkat/ml, which is much higher than we obtained from E. coli (445 nkat/ml) . The expression level is also higher than that of levels obtained from recombinant S. cerevisiae strain (1,487 nkat/ml) or other E. coli expression systems [13–15]. Furthermore, the level may be higher than that of T. reesei Rut C-30 if one takes into account that the T. reesei culture supernatant contains other enzymes (i.e. xyn1 and β-xylosidases) involved in xylan degradation [8, 20]. As shown in table 2 there are many family 11 xylanases that have been expressed in P. pastoris [1, 23–27]. However, most of them showed quite low expression levels, except in one study a higher level (11052 nkat/ml) was obtained for Aspergillus niger xylanase with the purity of the recombinant protein being 86% . As an unoptimized production level this is still missing from the efficiency of a recombinant T. reesei production system with published unoptimized production level of 32, 230 nkat/ml . However, optimization is likely to further improve the production efficiency also in P. pastoris. In comparison to Saccharomyces cerevisiae, P. pastoris may have another advantage in the glycosylation of secreted proteins because it may not hyperglycosylate. The mature Xyn2 produced by T. reesei has a molecular mass of 21 kDa as deduced from the amino acid sequence. The molecular mass of P. pastoris Xyn2 determined by SDS-PAGE is almost the same. However, the molecular mass of the enzyme secreted by S. cerevisiae is 27 kDa . There is thus a 6-kDa difference in the molecular mass of the Xyn2 secreted by P. pastoris and S. cerevisiae. This is caused by N-glycosylation , because S. cerevisiae tends to "hyperglycosylate" heterologous proteins. However, treatment of the S. cerevisiae Xyn2 with endoglycosidase F generated a new protein species with Molecular mass of 21 kDa, which corresponds to that of native Xyn2 produced by T. reesei . Though this large, glycosylated protein was efficently secreted into the culture medium, the lower expression level (1,487 nkat/ml) was not suitable for a large scale production. Because the enzyme was the predominant protein (over 95% of total protein) in the culture medium, the procedure for protein purification was not necessary. When Birchwood xylan was used as the substrate, the recombinant Xyn2 showed Km and kcat values of 2.1 mg/ml and 205.7 S-1, respectively. The pH and temperature optima of the recombinant Xyn2 compared well with the Xyn2 secreted by S. cerevisiae (Table 3). Both of them have a moderate thermostability and inactivated rapidly above 60°C[7, 8]. However, the P. pastoris Xyn2 retained at least 40% of its total activity after 30 mins incubation at 60°C. The improved thermostability could be caused by amino acid mutation or glycosylation. In this study, the Xyn2 gene [GenBank: EU532196] was cloned from T. reesei Rut C-30. However, the Xyn2 gene expressed in S. cerevisiae was cloned from QM6α [GenBank: U24191]. There are two substitutions at nucleotides 43 and 272 of the Rut C-30 Xyn2 DNA sequence, resulting in two amino acids (Try14/Glu91) in the protein being different from those in the protein (His14/Gly91) encoded by the QM6α Xyn2 gene. In contrast, the E. coli Xyn2 seems to be more thermostable than P. pastoris and native Xyn2. Our laboratory has previously reported an E. coli expression of Xyn2 which presents a desired thermostability and retained at least 70% of its total activity after 30 mins incubation at 60°C. The improved thermostability may result from the N-terminal fusion peptide (51 amino acids). When the fusion peptide was deleted by enterokinase, the recombinant Xyn2 retained only 50% of activity (unpublished results). Like with T. reesei Xyn2 expressed in S. cerevisiae, the pH optimum was the same for Xyn2 expressed in P. pastoris (pH 6.0). The enzyme was active over the range of pH 3.0–8.0. 2More than 60% of maximal activity retained. 3Optimum temperature was assayed at temperatures ranging from 20°C to 90°C for 10 min. 540% or 70% of total activity retained. T. reesei Xyn2 is classified to family 11 xylanases and is characterized by its small molecular mass and alkaline isoelectric point . The T. reesei Xyn2 have five binding sites (only three are found in Xyn1) for binding the xylopyranose rings in the vicinity of the catalytic site [30, 31]. Only few family 11 xylanases are known to have substrate-binding domain, e.g. Thermomonospora fusca TfxA and Streptomyces lividans XylB [32, 33]. TfxA binds to both cellulose and insoluble xylan, but the enzyme has activity against only xylan. In this study, the recombinant Xyn2 also exhibited a high activity for xylan, but a low activity for cellulosic substrates. These results were in good agreement with results from polysaccharide-binding analysis (Figure 4). When incubating the enzyme with Avicel, more than 95% unbound enzyme was detected in the supernatant. The hydrolytic capacity of the recombinant Xyn2 on pretreated substrates was also determined. More than 60% hydrolysis was obtained when oat spelt xylan (5%) was used as the substrate, whereas less than 30% hydrolysis was obtained with wheat bran. The decreased hydrolysis could be due to the fact that wheat bran contains more cellulosic compounds than xylan. In addition, the wheat bran is more difficult to dissolve. Usually, family 11 xylanases hydrolyze xylan to form oligosaccharides of different lengths . 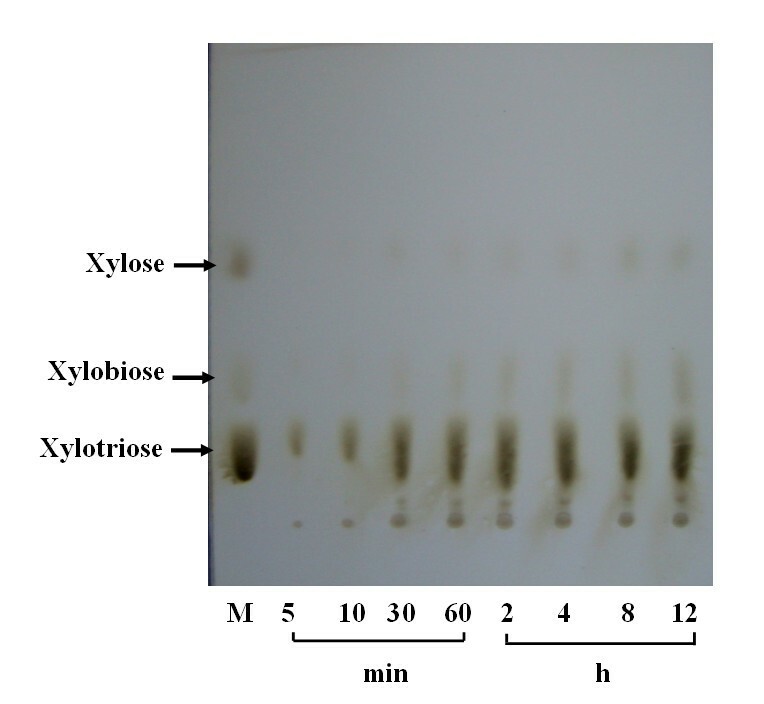 In this study, Xyn2 expressed in P. pastoris hydrolyzed the oat-spelt xylan predominantly to xylotriose and in smaller amounts to xylobiose and xylose (Figure 6), which confirmed the endo-acting nature of the recombinant Xyn2. The xylooligosaccharides (i.e. xylotriose) has been found to be helpful for the maintenance of a healthy intestinal microflora . But, the production of xylooligosaccharides is remaining a time consuming and expensive process. Therefore, the recombinant Xyn2 may be used for the large-scale production of xylooligosaccharides. In this study, the P. pastoris expression system designed for the high-production of Xyn2 allows large quantities of enzyme to be obtained in shake flasks. In addition, the recombinant Xyn2 produced by P. pastoris are pure and completely free of any contaminating cellulases. The recombinant Xyn2 exhibited a high specificity and hydrolysis capacity towards xylan. Coupled with its broad pH profile, all these features make the enzyme very useful for various industrial applications, such as in the animal nutrition and feed science. These results also suggested that the P. pastoris expression system is more suibtable for producing family 11 xylanases than other heterologous expression system. Future research in our laboratory will be focused on the development of a more effective vector for xylanase expression in P. pastoris and the co-expression of β-xylosidase or genes coding debranching enzymes will also be considered. P. pastoris X-33 was cultivated in YPD medium (1% yeast extract, 2% peptone, 2% glucose). Trichoderma reesei Rut C-30 was cultivated in basal medium (BM) [0.3% oat spelts xylan (Sigma), 0.4% KH2PO4, 1% (NH4)2HPO4, 1% peptone, 0.3% yeast extract] . Both these organisms were cultured in 1 L flasks containing 100 to 200 ml of medium at 30°C on a rotary shaker at 150 rpm. Recombinant plasmids were constructed and amplified in Escherichia coli DH5α cultivated at 37°C in Luria-Bertani liquid medium or Luria-Bertani agar. Ampicillin for selecting and propagating resistant bacteria was added to a final concentration of 100 μg/ml. One liter of T. reesei Rut C-30 culture was incubated in oat spelts basal medium for 48 h at 30°C. The fungal mycelia were harvest by centrifugation and frozen under liquid nitrogen. The frozen mycelia were ground into a fine powder with a sterile mortar and pestle, and suspended in a mixture of Trizol reagent (Takara D312), and total cellular RNA was isolated as described by the manual. The first strand cDNA synthesis was carried out with 100 ng of total cellar RNA by using a two-step RT-PCR kit (Takara DRR019A) as specified by the supplier. The DNA fragment encoding the T. reesei Rut C-30 Xyn2 was isolated from a first-strand cDNA mix by PCR with the two oligonucleotides Up1 (5'-ATAGAATTCCAGACGATTCAGCCCGGCAC GGG-3') and Down1 (5'-TTAGCGGCCGCTTAGCT-GACGGTGATGGA AGCAGAGC-3') supplied with the Eco RI and Not I restriction sites respectively. These primers were based on the sequence of the T. reesei Xyn2 gene, as published by La Grange et al . The PCR reaction was performed in 25-μl reaction mixtures (0.15 μM each primer, 1 μl of template DNA [about 10 ng of first-strand cDNA], 12.5 μl PCR premix [Boracker KT201–02]). Denaturation, annealing and polymerization were carried out for 1 min at 94°C, 1 min at 58°C, and 1 min at 72°C, respectively for 35 cycles. The PCR product was directly cloned to the pMD18T Simple Vector (TaKaRa D101A) and sequenced by Invitrogen (Shanghai, China) Co., Lid. The sequence was analyzed using the software package DNAman 5.0 (Lynnon Biosoft, USA) and the homology was analyzed in GenBank with the BLAST programs http://www.ncbi.nlm.nih.gov/BLAST. An E. coli/P. pastoris shuttle vector, pPICZαA (Invitrogen), was used to achieve secreted expression of xylanase. The mature Xyn2 gene obtained from PCR amplification was gel-purified and digested with EcoRI and NotI (Takara, Dalian) before cloning into pPICZαA. After transformed into E. coli DH5α, recombinant plasmids were selected on Luria-Bertani agar containing 25 μg/ml zeocin. The selection was checked by restriction analysis and sequencing. For P. pastoris integration, about 10 μg of recombinant plasmid was linearized with sacI, and transformed in P. pastoris by electroporation methods as described by the manufacturer (Bio-Rad, USA). The transformants were selected at 28°C on the YPDS agar plates containing 100 μg/ml zeocin. The integration of the Xyn2 gene into the genome of P. pastoris was confirmed by PCR using 5'AOX1 and 3'AOX1 primers. P. pastoris transformants were grown in 20 ml of fresh buffered minimal glycerol complex medium, BMGY [1% yeast extract, 2% peptone, 100 mM potassium phosphatate (pH 6.0), 1.34% YNB, 0.0004% biotin, and 1% glycerol] at 30°C until an OD600 of 5~6 was reached. Then, the cell pellet was harvested and resuspended in 100 ml buffered minimal methanol medium, BMMY [1% yeast extract, 2% peptone, 100 mM potassium phosphatate (pH 6.0), 1.34% YNB, 0.0004% biotin, and 0.5% methanol]. Sufficient supply of oxygen was assured by cultivation of the recombinant P. pastoris in 1 L flask (1:10 culture per flask volume ratio) at 250 rpm agitation throughout induction period. Absolute methanol was added every 24 h to a final concentration of 1% to maintain induction. The culture supernatant was collected every day by centrifugation. The supernatant was stored at -80°C before SDS-PAGE and analysis of its biochemical properties. A large scale production was performed in a 2 L bioreactor (B. Braun Sartorius Ltd.). Recombinant P. pastoris was grown in 200 ml BMGY medium. Temperature and pH were maintained at 30°C and 6.0, respectively throughout growth phase for 16–18 h. Agitation was kept within the range of 300–400 rpm. To induce enzyme production, cell pellets were resuspended in 800 ml of BMMY medium containing 1% methanol. The cultivation was maintained for 6 days by adding absolute methanol to a final concentration of 1% every day. Relative percentage of dissolved oxygen was maintained above 30% via adjusting agitation rate. Supernatants were collected every day and kept at -80°C before analysis. Cell pellets were washed, and dried at 80°C until constant weight was achieved. Sodium dodecyl sulfate-polyacrylamide gel electrophoresis (SDS-PAGE) on 15% polyacrylamide was performed by the method of Laemmli . The protein fractions were boiled for 3 min and applied to the gel. Proteins were visualized by Coomassie brilliant blue R 250 staining. The protein concentration was determined by the Bradford assay using bovine serum albumin as a standard . The recombinant protein exhibiting xylanolytic activity was detected by running it on native-PAGE (All denaturants were removed from SDS-PAGE) as described by Royer and Nakas . The gel was washed twice with distilled water and overlaid on substrate gel (1.5% oat spelt xylan, 1.5% agar in 50 mM sodium phosphate buffer, pH 5.0). The gels were next smoothed to remove bubbles, wrapped in plastic, and incubated at 50°C for 20 min. The gels were finally separated, and the substrate gels containing oat spelt xylan were immersed in 95% ethanol for 45 min and were photographed while raised approximately 12 in. (ca. 30 cm) above a black background. Xylanase activity was assayed by the method described by Bailey et al. , with 1% birchwood xylan xylan (Sigma) as the substrate at 50°C for 10 min. Appropriate dilutions of the recombinant protein (culture supernatant) in 50 mM sodium citrate buffer (pH 5.0) were used as the enzyme source. The amount of released sugar was determined by the dinitrosalicylic acid method described by Miller et al. . One unit (nkat) of xylanase activity was defined as the quantity of enzyme that liberated reducing sugar at the rate of 1 nanomole per second. The temperature optimum was measured by performing the xylanase activity assay at temperatures ranging from 20°C to 90°C. Thermostability was tested by heating enzyme samples for different times at various temperatures, and the activity was assayed at 50°C for 10 min. Assays at different pH values were performed at the optimal temperature over a pH range of 3.0 to 8.0. The buffer used were 50 mM citrate (pH 3.0), 50 mM citrate phosphate (pH 4.0 to 7.0), and 50 mM phosphate (pH 8.0), respectively. Substrate specificity of the enzyme was determined using different cellulose and hemicellulose substrates. The reaction was carried out in 50 mM citrate phosphate (pH 5.0) containing 2.0 mg/ml of each substrate at 50°C for 10 min. For each assay, six different substrate concentrations were prepared in 50 mM citrate phosphate (pH 5.0), and incubated with the purified enzyme at 50°C for 5 min. The Km and kcat values were calculated from the kinetics data as described by Jiang et al . The polysaccharide-binding capacity was determined by the method described by Tenkanen et al . Purified Xyn2 (30 μg) was incubated with different concentrations of Avicel or oat-spelt xylan in 50 mM citrate phosphate buffer (pH 5.0), at 4°C for 1 h with slow shaking. After centrifugation (10000 × g, 5 min), the supernatant was collected and tested for its xylanase activity. Unbound enzyme was determined by measuring residual activity in the supernatant. The hydrolysis of xylan-based substrates was carried out in 100 ml conical flask containing 50 ml citrate buffer (pH 5.0, 50 mM), 2.5 g xylan or wheat bran, 5 mg sodium azide and enzyme preparation (1000 nkat) as described by Adsul et al . The hydrolysis was performed for 6 days at 50°C, with a stirring rate of 150 rpm. The samples were analyzed for the reducing sugars after suitable time intervals. The hydrolyzed products of xylan was analyzed by the thin-layer chromatography (TLC) using silica gel plates 60 F 254 (E. Merck, Germany). Aliquots (100 μl) of the samples were collected at 5, 10, 30 min, 1, 2, 4, 8, and 12 h of the incubation period and 1 μl of the aliquot was spotted on the TCL plates. The plates were subsequently developed with two runs of acetonitrile-water (85:15, v/v) followed by heating for a few minutes at 130°C in an oven after spraying the plates with a methanol-sulfuric acid mixture (95:5, v/v) . A xylooligosaccharide mixture (Suntory Ltd, Japan) consisting of xylose, xylobiose, and xylotriose was used as the standard. This work was granted by Feed Biotechnology Project of Sichuan Province of China with grant No.2007Z06-050 and Program for Changjiang Scholars and Innovative Research Team in University with grant. No. IRTO555-5, China Ministry of Education. HJ and YB participated in the experimental design, carried out the molecular genetic and biochemical experiments, participated in data interpretation and helped draft the manuscript. ZK and DX conceived the study. CD directly supervised the project, participated in its experimental design and data interpretation and was responsible for writing the manuscript. All authors have read and approved the manuscript.